Cherry blossoms have a deep significance in Japanese culture and are a traditional motif in art, literature and cuisine. Over four hundred varieties of cherry trees grow in Japan. The blossom is a symbolic national flower and sometimes is offered to other nations as a symbol of friendship. 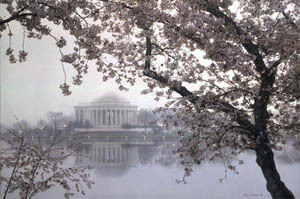 Since 1935, there has been an annual National Cherry Blossom Festival in Washington, DC, to celebrate the flowering of cherry trees, many of which were donated to the City of Washington from Japan in 1912 and again in 1965. Conversely, in 1952, cuttings from the original gift trees from Japan were donated to Japan by the United States to help augment cherry trees along the Arakawa River, whose care had been neglected during World War II. Magnificent Destiny is the fifth painting in Rod Chase's Foundations of Freedom series. Magnificent Destiny copyright© 2004 by Rod Chase is prohibited from being copied. 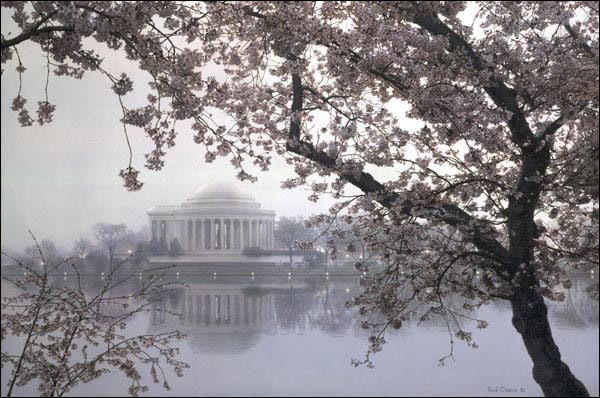 Rod Chase art, Foundations of Freedom series, Jefferson Memorial, Washington DC, historical landmarks, patriotic, Americana, artwork, art work, canvases, images, paintings, pictures, and prints of Magnificent Destiny by artist Rod Chase for sale. Magnificent Destiny painting by artist Rod Chase can be purchased in art print or canvas form at special sale prices at Christ-Centered Art.